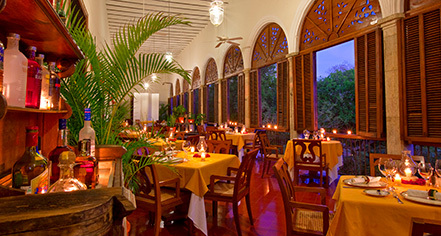 Temozon Restaurant overlooks the breathtaking main gardens, swimming pool, and the old factory buildings. The menu is a blend of regional and international cuisines, using organic ingredients grown in the gardens. The bread is baked daily in the hacienda and fresh fish is sourced locally from the surrounding coastal villages. For a truly intimate and dreamy dinner, ask for “Romantic Dinner” arrangements. 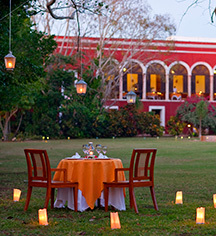 Dinner for two is served in a perfect hideaway, where the grounds are lit by twinkling candles and singing from the 50 species of birds living on the hacienda fills the background. The bar is well stocked and a splendid place to unwind and enjoy a Mexican beverage. Restaurant, 7:00 a.m. - 11:00 p.m.
Bar, 9:00 a.m. - 11:00 p.m.